When it comes to false tanning, I’ve tried pretty much all of the top brands out there. I have a drawer full of them so if you ever come over to my house, you’re welcome to go home suitably bronzed should you care to top up your tan! 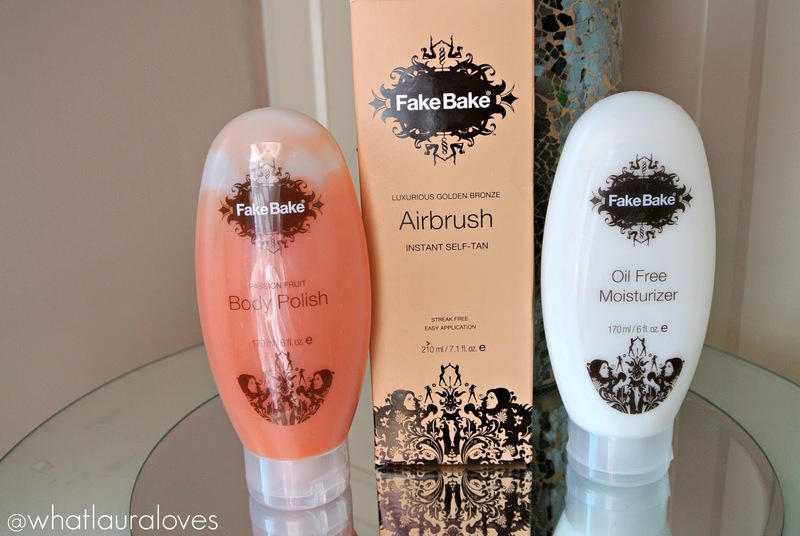 The brand that I always go back to though is Fake Bake, specifically their Airbrush Instant Self-Tan. There’s just nothing that compares to it out there and I’ll be telling you why later in this post. 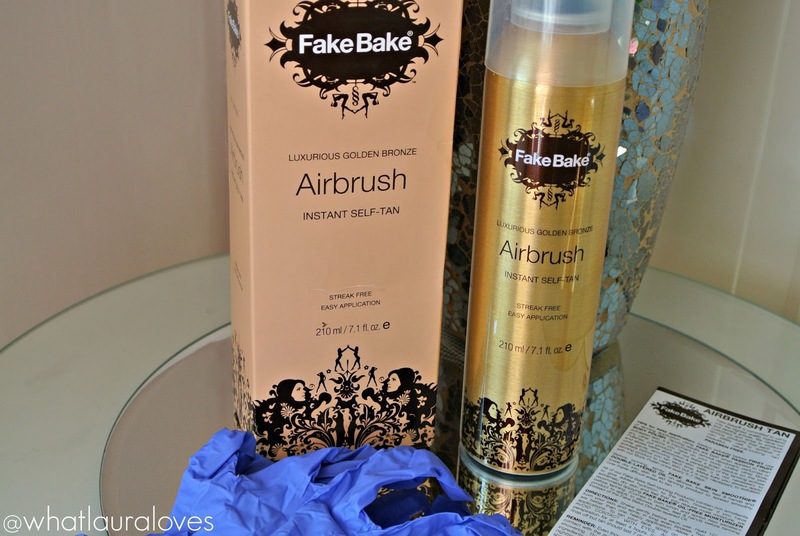 Rather than just sharing my review of the Airbrush tan with you, I wanted to share my tanning routine as well and my thoughts on a couple of other products that I also use from Fake Bake. They are really important in my tanning routine not just when I’m using a Fake Bake false tan but when I’m trying out any other tan too. These are new bottles so I thought I’d best put this together now while they’re still looking all awesome as I go through these so frequently! First up is the Fake Bake Body Polish. I’ve been using this for years and years, almost as long as I’ve been using the Airbrush tan for. Whenever you’re going false tan, its really important to ensure that your body is buffed and smoothed before application to reduce the chance of the tan clinging to dry areas. The easiest way to do this is with a good body scrub. I’m someone who uses a body scrub on a very regular basis anyway as I like the way that my skin looks and feels after a good polishing. I’m sure you’ve all heard me talk about the Soap and Glory scrubs before as they’re my favourite for keeping my body smooth but I don’t like to use them, or any other scrubs, while I’m tanning because a lot of them contain oils that can interfere with the tan. That’s where the Fake Bake Body Polish comes in. The night before I’m going to apply my false tan, I scrub my whole body with the Fake Bake Passion Fruit Body Polish. This, as the name would suggest, is a body scrub with a passion fruit scent and let me tell you, it smells delicious! Its a funny one to describe the scent of as its not straight up passion fruit. You can certainly smell the passion fruit in there but theres a mix of holidays and apple crumble too as strange as that may sound. I said that to my friend recently and after initially discarding my thought, she smelt it again and was like ‘OMG you’re right’ haha. I don’t know, whatever it is, it is gorgeous thats for sure! The best thing about this scrub though, is undoubtedly the exfoliating particles that are sat within the gel. They’re very small and finely ground and theres plenty packed into the product. This gives the scrub a fantastic abrasive effect on the skin and if you wet your skin first in the shower and then move out of the stream of water then you’ll find that it is even more abrasive and polishes your body so effectively, you’ll feel as smooth as a baby. The exfoliating particles are actually made of tiny bits of loofah that work to gently but incredibly effectively, slough away the dead skin cells from the surface of the skin. The scrub is formulated with natural botanical extracts, including Aloe Vera, Chamomile, Elderflower, Sage, Fennel and Yarrow that help to soften and polish the skin. The Fake Bake Passion Fruit Body Polish leaves my skin feeling so soft and smooth but not tight or dry in the slightest which is great, especially when you’re going to be applying fake tan afterwards. After I have tanned and washed off the guide colour, I then exfoliate my skin with this body polish in the shower every other day. This helps to keep the colour even and ensures that the tan fades gradually and evenly rather than in patches like some false tans can. I’m often asked which false tan I would recommend for beginners. I’m also often asked about what my favourite false tan is. The answer to both questions is always the Fake Bake Airbrush Instant Self Tan. Many, many moons ago, I wrote a review of this tan after I saw Amy Childs using it on her documentary/reality show and I bought it based on her recommendation, not realising how much I would love it. You can read my full review here and although the photos are a big on the dodgy side (thanks iPhone), my thoughts on this tan are exactly the same, which is why I’ve repurchased it more times that I care to think about! Firstly, it is incredibly easy to apply which makes it great for those who aren’t used to applying false tan or for those who have struggled with application in the past. It comes in a spray can with a nozzle that can spray 360 degrees which makes it so seamless to apply as you can spray it from any angle. It also makes it very easy to apply the tan to your back which is an area that I really struggle to reach, as do many fake tan wearers out there. Unless I have my hubby helping me, I find it really hard to reach the middle of my back with a lotion or a mousse tanner, whereas with the Airbrush tan, I can simply spray from a distant and the tan is applied without fault. I like to spray the Airbrush tan from a distance and then buff it in slightly with a mitt which I find is the best way to apply it because it ensures that the product is even on the skin. Fake Bake Airbrush is definitely a light coloured tan which makes it ideal for those who are very fair or pale. It isn’t the kind of tan that you’re going to put on and look like an Oompa Loompa after a couple of hours. I usually leave it to develop over 6 to 8 hours before washing it off and every time, I’m impressed with the colour that it leaves my skin. Very naturally sun kissed. I’ve never had anyone ask me if I’m wearing fake tan when I have this tan on but I do usually get a couple of compliments asking if I’ve been away on holiday or from people saying that my skin looks lovely. The great thing about this tan is that it doesn’t settle into pores or fine lines, so I find that I can apply it all over my face and body and there aren’t any tell tale signs left behind. In case you’re looking for a deeper colour, it can easily be layered too. The colour and formula is very buildable so if I’m ever going to an event and want to look quite dark then I’ll just apply it two nights in a row. With a lot of false tans, that would seem like a bit of a faff on to me but the application of this tan is so quick and easy that it only takes a matter of minutes. The nozzle is really accurate so it doesn’t end up going all over my bathroom like the St Moriz aerosol spray fake tan does and it dries quickly on the skin too so I’m not stood around waving my arms in the air waiting for it to dry. I literally spray it on, pop my PJs on and climb into bed. I think I take longer putting body moisturiser on than I do applying this great tan! 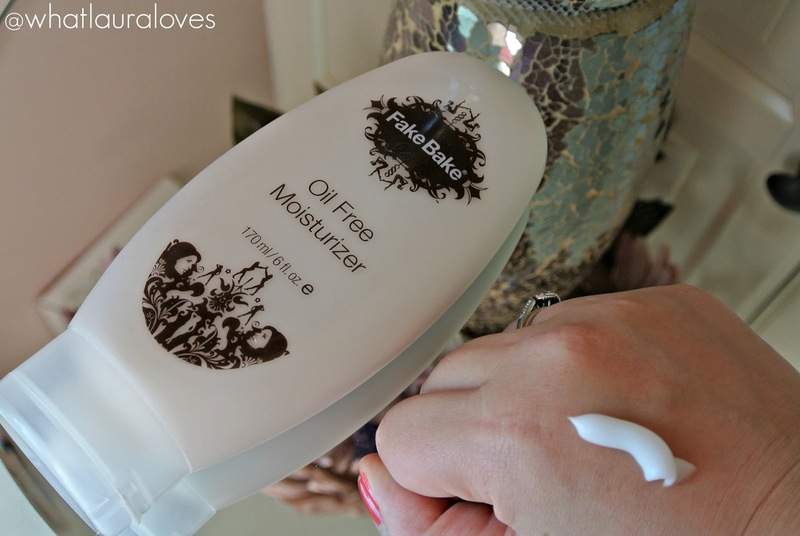 Speaking of body moisturiser, the product that I’ve been using to keep my skin soft and supple for YEARS is the Fake Bake Oil Free Moisturizer. Of course, I have body lotions coming out of my ears but the only one that I turn to when I’ve got my false tan on is this one. That’s because the formula is free from oil. False tan can really be broken down by oil so using moisturisers with oils in when you’ve got your tan on is a no go as you’ll end up taking it off quicker than you applied it. Plus if you use an oil based moisturiser before you tan, your tan wont take as well as if you used an oil free one and may look patchy or lighter in some areas than others. The oil can strip the tan from your skin and you can end up patchy. The upside of this is that oil based products are great for when you’re wanting to remove the last bits of your tan. I tend to slather my body in baby oil and get in the bath or shower (be careful, this is very slippy and there’s many a time that I’ve nearly gone bottom over breast!) and use exfoliating gloves over my whole body to scrub away the last bits of tan. The Fake Bake Oil Free Moisturizer is a great option if you’re looking for a body moisturiser to use while you’re tanning. I use this the night before I tan, all over my body and then on the day that I’m tanning, I apply more to my dry areas like my heels, wrists, knees and elbows. This product ensures that these areas of my skin are soft so that they take the tan with a light coverage and stop it from clinging to the skin. While the coverage is lighter in the areas where I’ve applied the moisturiser, it looks gradual and natural, not stark and patchy. After washing off the guide colour from my false tan, I then moisturise every day using this moisturiser. It has green tea and ginger in it that helps to promote moisture retention for dry skin while these ingredients also have soothing qualities that help those with sensitive skin or irritated skin by soothing it. It has a very light, none offensive scent that I think everyone will enjoy and it sinks into the skin quickly, feeling instantly hydrating. Each of these products for me are fabulous in their own right but the three of them together as a tanning routine are absolute winners. If you’re looking for a healthy, natural looking sun kissed tan that is fuss free and easy to apply and maintain, then you simply need to try these products. You can shop the Fake Bake Airbrush tan, the Body Polish and the Oil Free Moisturizer ON SALE (at time of writing) and with FREE DELIVERY here! 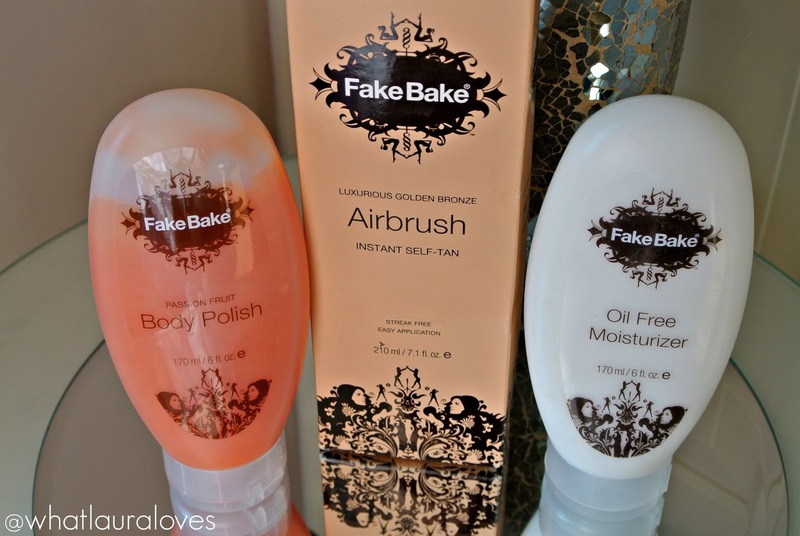 What are your favourite Fake Bake products? Wow you look fantastic girl! Like a golden goddess! ♡ I like the idea of an airbrush tanning spray!! Makes it seem so much easier. I've never used this brand before, but the results look amazing! Oh wow ! You probably know (by now ) that I am a huge fan of tanning :)))) I should put this on my list, I was still looking for something just for my face.You look amazing ! You look amazing with that tan! These look like great set of products.